2. Select the Language and Keyboard layout from the first screen and click Next. 3. Click on Repair your computer in the next screen. 4. Select your Vista installation from the dialog box and click next. 7. Type exit to close the command prompt. Then hit the Reboot button. 8. The computer should now boot back to Vista..hurrah! but where's the Fedora installation? 11. The installer will prompt you with a few questions (Which unfortunately I can't remember now). They are fairly obvious and simple questions so there should be no issue in getting past them. 12. Finally the installer will mount your Fedora installation into /mnt/sysimage and provide you with a menu to start a shell or reboot. Select the option to start the shell. 15. 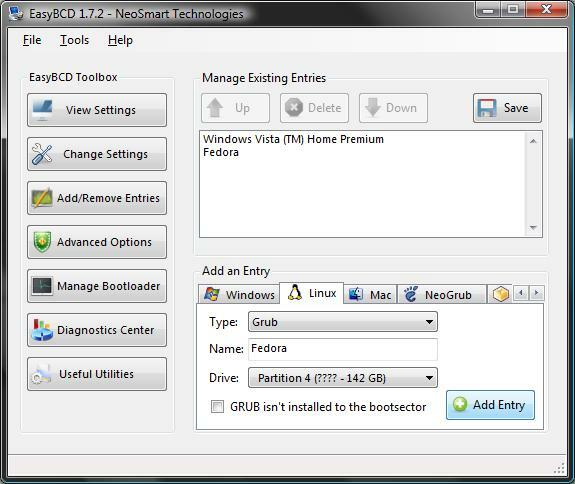 Run grub-install with the correct device path to install Grub in the Linux partition. 17. You will boot back to Vista. 20. Click on the Linux tab and select the drive where Grub was installed from the Drive drop-down. You can optionally change the name from "NeoSmart Linux" to "Fedora" if you like. 21. Click Add Entry to save the entry. 22. Restart the computer. You should now be presented with a boot menu. Select the Fedora option (If you named it Fedora in the previous step) and Fedora should boot up! Nice Bro, This is the Exact and the Most convinient way to do thi, I too had a prob with my frnds(Kasuns) netbook and after mind eating 2 days this is the exact way that I did it. BTW I think that the middle fedora 12 re installation of the grub is useless as it can be done within the easyBCD. Anyway great article So that we can remember this. Anyway adding a grub entry to the new grub 2 is not an easy task as adding a item to the menu.lst as in grub 1. So this is the only life saver to now. Again , Great work.